Last night we went linedancing. A cultural experience, if you will. The theme of the evening was "hoot squared". The plan was that first we'd dine (if you can call it that) at Hooters (one of the six in San Diego, I learned). 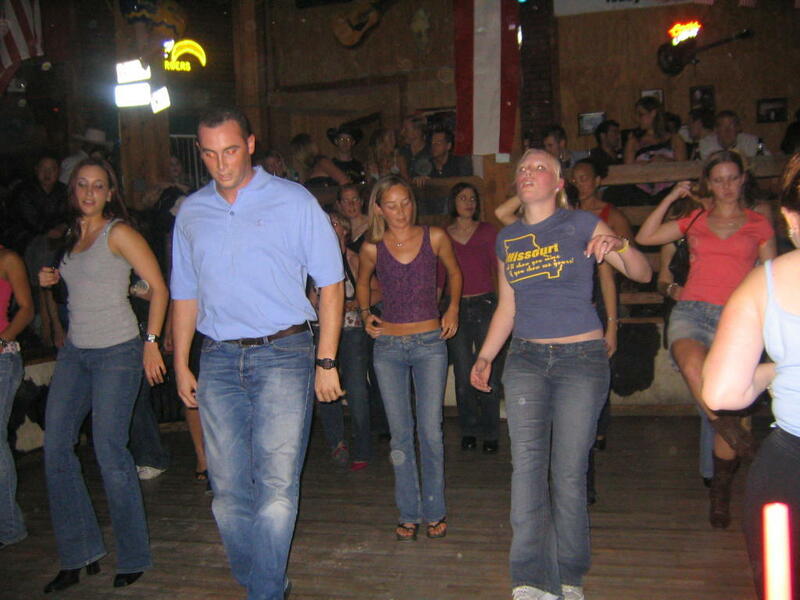 Then we would mosey down the street to a country western bar called In Cahoots, where we would learn the folk dances of white people. Who could resist? Not me. Hooters was, well, anticlimactic. Women with cosmetically improved breasts greeted us with sorority-pitched voices (yes, I realize it takes one to know one) "Hiiiiiiiiiiiiiii!!!!!!! Welcome to Hooters!". Then we sat at a table and our waitress (whose silicone stretched skin had an uncanny resemblance to pork casing) proceeded to take the guys' orders. Then she left. No, I am not kidding. Her little bleached-blonde head turned, and her orange short shorts and tan tights and 1985 aerobic stacked athletic socks and white sneakers marched out of view. I wasn't going to be a hater. I had gone to Hooters with an open mind (Um. obviously). But this meant war. When I asked her if I could order my dinner as well, she looked extremely perplexed (confirming my belief that they don't let their waitresses eat. Ever.). "Um. Okay. Like. I'm gonna take these drink orders. And then? Um. I'll come back and take orders." This as wing sauce dripped down the faces of a gleeful Ryan, Eric, Jon and Hong. I took a moment to memorialize the signs the girls had worked soo hard to make. (Author omits another dig at sorority girls). "Have you seen our new Sea Food menu?". Apparently this is two words. You learn something new every day. Thanks Hooter Girls! I'll spare you the rest of the dining experience, which included but was not limited to some guy trying to hit on me on my way to the bathroom. Um, let me just make a public service announcement here and now. Gentlemen: Times not to hit on a woman include when she is beelining for the bathroom. Secondly, do not assume she speaks Spanish, no matter how Latina she looks. Finally, when trying to woo the ladies, Hooters might not be your best bet. At least save it for the parking lot. Jeez. So then we went to In Cahoots. Somewhere along the way, while living my little urban lifestyle, I failed to realize that people line up, 100 people deep, for hours outside this bar in Mission Valley. A fair number (read: more than one or two) were in their white cowboy hats and Wranglers. Everyone had their shirts tucked in, as per the dress code. Seeing men with shirts tucked in is worth your $7 admission alone. I thought it must have been a Spring Break rush, but apparently that's the norm over there. What people won't do for $1.75 you-call-its. As we approached the door, 2Pac's "California Love" came blaring from the rustic windows. Um. Yeah. So we went in, and made for the bar, as any woman worth her salt would. Armed with my wine freshly poured from a generic jug under the bartender's counter, I made my way to the dancefloor. That's where I saw Owen. So nicknamed by Gemma for his resemblance to a famous actor of our generation, he was a sight to behold. The only way I can describe it is this: ballroom dance champion with cowboy fashion sensibilities. I mean, this guy was a GOOD dancer. While some others (one guy who I would end up dancing with, as luck would have it) danced their partners around the floor with all the grace -- and speed- of a drag race, Owen stood out. As did his unbuttoned shirt boasting, well, not a single chest hair. I think the stetson laying low on his face helped mask all of his 19 years or so. You learn a lot by going new places. A good share of my evening was spent peoplewatching under the banner/excuse of "I'm middle eastern. We don't stomp." I learned that there is a line dance to Sweet Home Alabama. I also learned that some company actually makes tee shirts that say "Save a horse. Ride a cowboy." I learned that there are people who actually wear them. I learned that the scrawniest guy will surprise you and be the best dancer. I learned that there are dances that people with no rhythm can perform successfully. I learned that, lest any of you out there be worried your time is running out, it is socially acceptable in some circles to make out on a dance floor when you're 35, 40, nay 50. I learned that country music can be bearable in mass quantities in the right situation. You should have danced with me. So that gross guy would have left me alone. No thanks to $2 you-call-its. "Don't forget to jump over fire tonight. Love, Dad"
Lest ye be under the mistaken impression that the only holidays that exist are those alloted careful space on Hallmark shelves, let me welcome you to Persian New Year. For all the negative press Middle Easterners get, you think we'd get a teensy bit of recognition for the creative spark to our holidays. Tonight is Char Shanbeh soori. What this involves is good food, jumping over fire (or carrying old people over fire, which rivals Chapelle's Show in hilarity), and friends. No presents, just good people and maybe some dancing if you're one of 5000 Iranians to crowd onto the grass of Mission Bay. In any case, like I said, Santa was the man. I tried to ignore my dismay that so many of my friends had oh so many nights of gifts coming their way and did my best to loot at Christmas, in between jetting to exotic warm destinations. However we had one secret in our pockets. Right around March 21st, Mom would call us in sick for the day, citing family obligations. Hey, any family where staying home and dressing up in new clothes and eating til you're sick and then ceremonially accepting wads of freshly printed cash from family friends is a family I want to be part of. My American friends leaned in closer. "You get *what*?" I'd beam back the free advertising smile of the daughter of a dentist. "Yup, money." "Like how much?" "It depends." But it didn't really. My parents were always extremely generous. Once in awhile there was a gift. Like the year my dad got into the spirit and bought me a 'ghettoblaster' and taught me how to dub tapes. Most often it was crisp cash tucked within the pages of the Quran. God help me escape the mental connectio between Quran pages and Benjamin Franklin's face on a sheet of green. Sometimes I think they amortized the compensation for Iranian-hostage-crisis-related-trauma over the course of the years, paying their children in installments. As we gathered around the haft-seen to take pictures, images of my forthcoming trip to loot Musicland danced in my head. So tonight my friends and I will jump over a fire (Rule Number One of Persian Living: Always listen to your parents! ), symbolically giving it our sickness and taking its vibrant heat. On Sunday morning, the actual New Year (the first day of spring), my family will awaken and dutifully dress in new clothing from the skin out and stand around our haft-seen at 4:30 in the morning. The haft-seen will be a notch more elaborate than last year, and the lilac plants will make me sneeze as much as I will have the night before courtesy of Persian men self-doused in cologne for the cultural society's party. We'll smile for the camera. My parents will vigorously snap shots of the Endangered Son In Suit and Tie, and we'll each critique the photos before deleting and retaking in an incessant cycle (because we expect somehow to look GOOD in these photos at 5am, don'tchaknow?). Ritual complete, family and guests will slink back to our rooms. Then I might make a quick return to slip a few more pieces of the baklava, but there will be no witnesses to my crime. As I wander back down the hallway to my own room, I don't know what will go through my mind. What I do know is that part of me will be very very glad that there is no construction paper that comes close to capturing the colors of this holiday.